Direction (1-5): Study following information carefully and answer the questions given below. 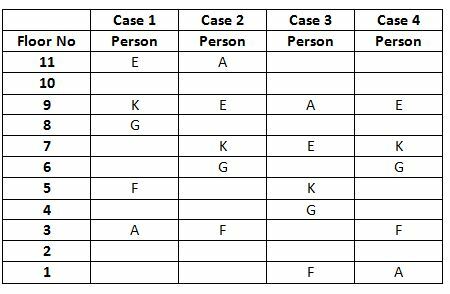 Eleven persons-A, B, C, D, E, F, G, H, K, L and M are living in a eleven floor building. The lowermost floor is numbered one, above it numbered two and so on until the topmost floor is numbered eleven. Only two persons live between F and G. Only four persons live between A and G. E lives on one of the odd number floor but above the floor number five. Only one person lives between E and K. The number of person lives below A is as same number of persons lives above C. The number of persons lives between C and G is as same number of persons live between B and L.B lives on one of the floors above L. K lives immediately above G. M lives on one of the even number floors above L. H lives on one of the floors above D but below A. K lives on one of the floors below E.
1. How many persons are live between H and F? E lives on one of the odd number floor but above the floor number five. Only one person lives between E and K.
K lives on one of the floors below E.
K lives immediately above G.
Only two persons live between F and G.
Only four persons live between A and G.
Now we have 4 cases. 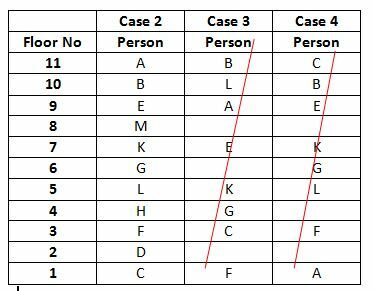 The number of person lives below A is as same number of persons lives above C.
The number of persons lives between C and G is as same number of persons live between B and L.
B lives on one of the floors above L.
From the above case 1 was dropped. M lives on one of the even number floors above L.
H lives on one of the floors above D but below A. From the above condition Case 3 and 4 was dropped. So the final arrangement is..
2. Four of the following five are alike in certain way and thus form a group as per the given arrangement. Which of the following does not belong to that group? 3. How many person lives on above B? 4. D lives on which of the following floors? 5. How many persons live between A and L? 6. A man pointing the woman in the photograph, he introduced that, She is the only daughter of my father’s sister’s only daughter’s aunt. Then how is a woman related to the man? 7. How many such pairs of letters are there in the word WHATSAPP, when they are calculated both in both forward and backward direction in alphabetical order? 8. How many students are in the class? If Anu’s rank is 31st from the bottom.Arya’s rank is 27th from the top. Only three students are ranked between Arya and Anu. Anu scored highest rank than Arya. 9. In certain codes ‘REVOLUTION’ is coded as ‘TGXQNWVKQP’. Then What is the code for the word ‘RELIGIOUS’ while coded in above method. The code of alphabets +2followed in the given series. 10. If all the letters in the word, ‘RESPONSE’ are arranged in alphabetical order from right to left, Then how many letters will remains in their original position? 1) How many persons are live between H and F? 2) Four of the following five are alike in certain way and thus form a group as per the given arrangement. Which of the following does not belong to that group? 3) How many person lives on above B? 4) D lives on which of the following floors? 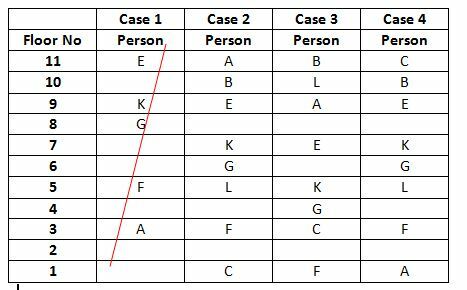 5) How many persons live between A and L? 6) A man pointing the woman in the photograph, he introduced that, She is the only daughter of my father’s sister’s only daughter’s aunt. Then how is a woman related to the man? 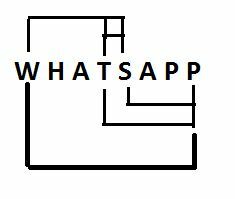 7)How many such pairs of letters are there in the word WHATSAPP, when they are calculated both in both forward and backward direction in alphabetical order? 8) How many students are in the class? If Anu’s rank is 31st from the bottom.Arya’s rank is 27th from the top. Only three students are ranked between Arya and Anu. Anu scored highest rank than Arya. 9) In certain codes ‘REVOLUTION’ is coded as ‘TGXQNWVKQP’. Then What is the code for the word ‘RELIGIOUS’ while coded in above method. 10) If all the letters in the word, ‘RESPONSE’ are arranged in alphabetical order from right to left, Then how many letters will remains in their original position? The code of alphabets +2 followed in the given series.